and the paps which thou has sucked. will overflow everywhere in a torrent. 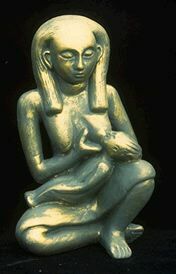 Isis was one of the first Madonnas, frequently protrayed as nursing Horus, her Divine Son. She was highly venerated during the years of the early Christian church, and most scholars agree that the cult of Isis strongly influenced the cult of Mary. “Our Lady of Light” was one of Isis’ many titles, and in one sacred story, she gave birth to the sun. It is no coincidence that Christmas, the celebration of the birth of Mary’s son, The Christ, is celebrated at the same time of year as Winter Solstice, the celebration of the re-birth of the sun, the return of the light. name Mary as “Theotokos,” the God-Bearer. the many-breasted Mother Goddess (also worshiped under the name, Diana). St. Bernard and also St. Teresa. As Goddess of Grain, Demeter, freely loaned her attributes to Mary as well. The Earth Mother has always been responsible for protecting and ensuring the health of crops. As a Mother Goddess, this falls into Mary’s sphere. 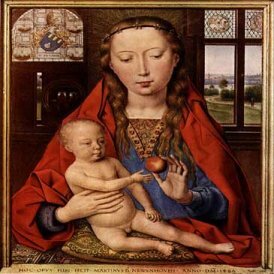 Grain miracles attributed to Mary decked many church walls and stained glass windows by the late Middle Ages. In one Christian legend, grain sprouted from a barren field that Mary passed during her flight into Egypt. Madonna del Spica in Italy holds sheaves of wheat in her arms, as does Our Lady of the Prairie in North Dakota. Mother Mary provides — through her breasts, through the earth, through her words, miracles and appearances. As Goddess, she is World Mother, the Mother of us all.